Carlos Juan Busquiel began playing the guitar at age 12, although he formal studied violin. His interest on luthery began when, self-taught, he embarked on the construction of an electric violin for personal use. It was a very simple instrument, but it helped him to enter the world of violin making. The next step was the construction of an acoustic violin, based on the “Kruse” Stradivari. 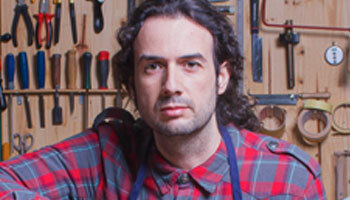 By then he met in Cadiz master guitar maker Rafael Lopez Porras, who introduced him in the art of guitar making. Rafael was his first teacher and conveyed him the passion for the construction of the Spanish guitar. From that moment, Carlos was dedicated only to build guitars and was able to complete his training with Grandmaster Jose Luis Romanillos and Jaume Bosser. To meet Romanillos and listen to his advice was decisive for Carlos, he could develop the concept of “Spanish guitar” and know its traditional construction features, based on the designs of Antonio de Torres. Later, José Luis Romanillos also gave advise to Carlos during the construction of a Torres replica. Because of these influences, Carlos Juan Busquiel leans toward a very traditional type of construction. He mostly use spruce for his tops, which he builds with the traditional fun bracing and using only wood as raw material, looking for a lightweight and easy to play, very expressive and musical guitar. When working with cedar tops the construction is focused differently. A slightly heavier instrument, where the objective is that the energy of the string is left at the top, producing a powerful sound out of a guitar that responds readily to the touch. Carlos works at his workshop in Petrer, a town in Alicante, on the Spanish east. From here his guitars travel to other parts of the Spanish geography, Europe, Asia and America.